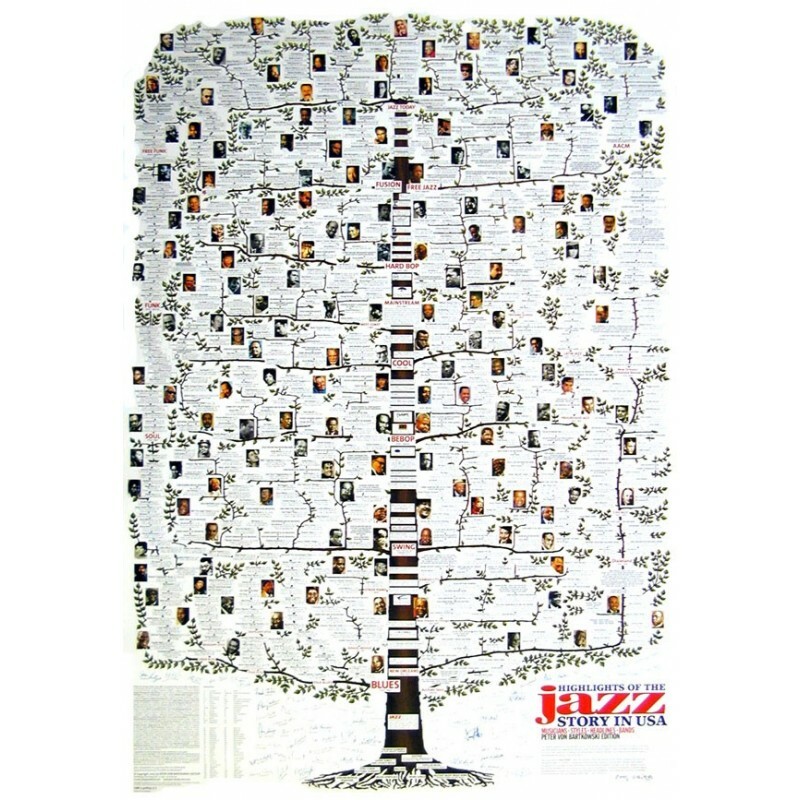 The genealogy of US Jazz is presented here with 170 photographs, 920 artist/band entries, and 83 reproductions of artist signatures - all in one poster. 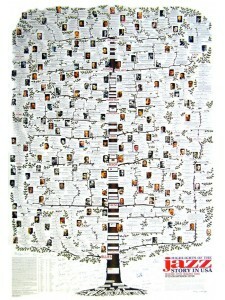 This remarkable poster beginning at the bottom with the roots of Jazz and working up through the evolution of Jazz: Archaic Jazz, New Orleans, Swing, Bebop, Cool and on to Fusion and Free Jazz, with branches leading to the Blues, Soul, Funk and more. 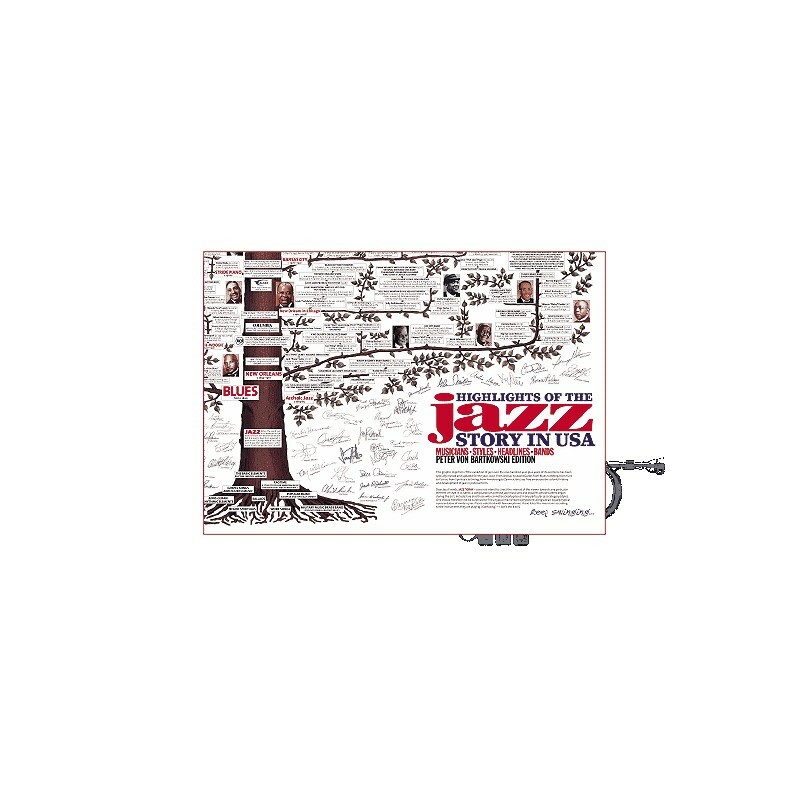 The artists featured in the poster include: W. C. Handy, Louis Armstrong, Sidney Bechet, George Lewis, Jay McShann, Bob Zurke, Willie Smith, Duke Ellington, Coleman Hawkins, Lionel Hampton, Benny Goodman, Illinois Jacquet, Charlie Parker, Dizzy Gillespie, Oscar Peterson, Bix Beiderbecke, Thelonious Monk, Dexter Gordon, Teddy Wilson, Charlie Barnet, Gene Krupa, Bunny Berigan, Horace Silver, Sonny Rollins, Stan Kenton, Lennie Tristano, Cannonball Adderlry, Joe Henderson, George Adams, Ornette Coleman, Herbie Hancock, Buck Clayton, Mike Brecker, Wynton Marsalis, Roy Hargrove, Pat Metheny and many more.